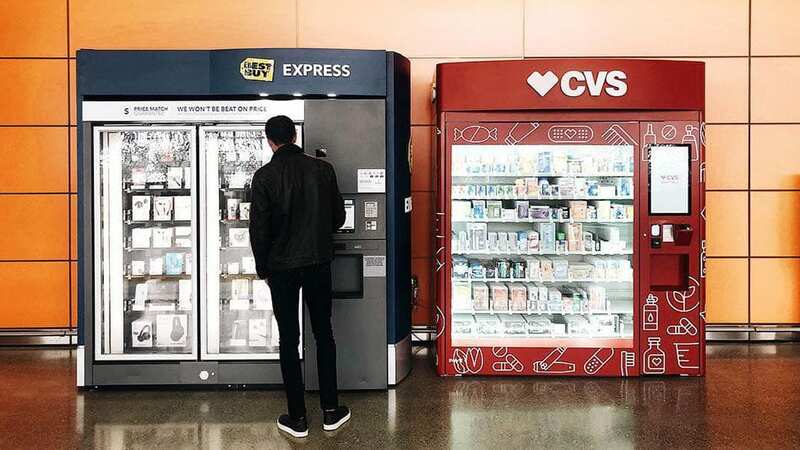 SAN FRANCISCO, Sep. 20, 2018 /PRNewswire/ — Swyft, Inc. and ZoomSystems announce the installation of Best Buy Express and CVS Pharmacy automated retail stores in the new Salesforce Transit Center. Salesforce Transit Center, owned and operated by the Transbay Joint Powers Authority (TJPA), opened on August 11, 2018, and connects tens of thousands of residents, commuters, and visitors daily in the San Francisco Bay Area. Swyft, Inc. and ZoomSystems have plans to install additional automated retail stores featuring other major brand partners in the upcoming months. “We’re excited to have Swyft and ZoomSystems at Salesforce Transit Center for their first locations in San Francisco. It is will be a great travel retail concept that provides product accessibility to commuters and visitors,” said Deborah Kravitz, President Pro Retail, Inc. manager of the pop up retail program at the center. The Best Buy Express and CVS Pharmacy automated stores offer immediate gratification and convenience in on-the-go shopping environments. The automated stores provide commuters the same benefits as shopping in-store, with competitive pricing and detailed product information on the touch screens. The Best Buy Express ZoomShops feature headphones, speakers, phone chargers, travel gadgets and other popular products by brand names like Apple and Bose. Whilst CVS Swyft Stores will stock over-the-counter health products, first aid essentials, and popular personal care products. Swyft and ZoomSystems work with major global brands and retailers to deploy highly-scalable automated retail stores without disrupting their traditional retail channels. Swyft and ZoomSystems have identified the large North American mass public transit networks across the country like the New York City subway, Chicago ‘L’, Washington Metro, MBTA, BART, PATH and others as strategic location partners to expand smart automated and unattended retail solutions. Both companies expect this channel to grow dramatically as they introduce new unattended retail technology into the large food and beverage markets. In addition to mass transit partners, Swyft and ZoomSystems are expanding their network of location partners to include hospitals, transit centers, gyms, grocery stores and residential buildings. Swyft, Inc. – a leader in the automated retail and retail automation industry – is a technology and services company that increases sales and profits and enhances customer experience for retailers, brands and independent operators using low-cost hardware and robotics, flexible cloud-based software and scalable operating partners. ZoomSystems operates over 900 automated retail shops across North America and Europe for iconic retailers and brands such as Proactiv, Best Buy, Nespresso, Benefit Cosmetics, and UNIQLO. ZoomSystems’ end-to-end hardware, software and services solutions complement existing omnichannel strategies by offering both satellite and in-store options that allow brands increase reach, reduce shrink and improve sales through a better customer experience. The Transbay Joint Powers Authority (TJPA) is a historic collaboration between Bay Area government and transportation agencies. The TJPA’s eight-member Board of Directors is composed of representatives of the City and County of San Francisco, the Alameda-Contra Costa Transit District, the Peninsula Corridor Joint Powers Board, the California High-Speed Rail Authority, and Caltrans. The TJPA oversees the financing, design, development, construction, and operation of the Transbay Program, a visionary transportation program that has reached a pivotal milestone: the opening of the Salesforce Transit Center to the public in 2018. The new state-of-the-art Center enhances mobility for a growing city and region by connecting transportation services, and will ultimately connect Caltrain and California High-Speed Rail. The Center features a 5.4-acre rooftop park and botanical garden, programmed public space, more than 100,000 square feet of shopping and dining, pop-up retail, and world-class public art. Funding for the Transbay Program comes from the U.S. Department of Transportation, the State of California, the Metropolitan Transportation Commission, the San Francisco County Transportation Authority, the City and County of San Francisco, the San Mateo County Transportation Authority, and AC Transit. A Naming Rights Agreement with salesforce.com provides partial funding for operation of the Center.